Are you looking to build the next big app or SaaS application? Or maybe you’re just looking to build a back-end for a client. In any case, building a dashboard from scratch is a lot of work. In addition, you may not have the design skills required to make your dashboard beautiful and eye catching. Thanks to the Bootstrap framework, many designers have been creating beautiful Bootstrap admin templates that are fully responsive and loaded with useful components and features. The following is a list of beautifully designed Bootstrap admin themes you can use to kick-start your next dashboard or web application. Boom Admin is a full-featured, versatile web app and dashboard template. Featuring Bootstrap 3.1, AngularJS and JSON data services. Boom is jam packed with features and components and utilizes several different pages and layouts. Flat Dream is a responsive admin template based on Bootstrap 3.2. It has a flat design and beautiful features ready to use in your next project. Flat dream contains a wide variety of modals, 10 preset color themes, and also includes customizable less files to create your own color themes. Srikandi is a responsive admin template built on Bootstrap 3.2 containing over 40 different pages. It uses an overhead navigation instead of a sidebar to give it a very unique look and feel. Proctor is multi-page admin and front end theme. Both the themes follow the same design philosophy to maintain consistency and impact. The clean and minimal design lets you focus effortlessly on the data. Proctor comes stocked with essential UI elements to cut down on the development time. Perfect Admin is a fully responsive admin template built with the Bootstrap 3.0 framework and modern web technology. It features a flat UI with a clean design and 7 different preset color themes. Flatter is a mobile first web app theme. It is built off Bootstrap 3.1 with neatly organized HTML and CSS, carefully crafted from head to toe. It uses retina graphs and icons and scales appropriately to any device. eKoders Admin is a very light weight, fully featured and easy to use Admin theme. It’s based on bootstrap 3.2.0 and includes most of the popular and required plugins. It can be used for many types of CMS, web applications, admin panels, and client panels. Bluewaves Admin theme is a beautifully coded fully featured admin panel. It is very lightweight and easy customizable. The CSS and JS files for every plugin are split so that you can easily exclude the plugins you don’t want to use. This keeps everything nice, clean and fast-loading. MyxDashboard is a clean and elegant template suitable for any back-end application. Created using Bootstrap 3.2, it is intended to be lightweight and easy to use and customize. 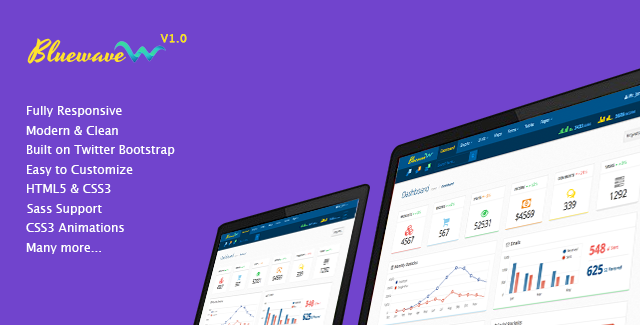 Aqua is a flat dashboard template based on Boostrap 3 and Bootflat. It’s designed to be clean and easy to customize. Aqua has a great collection of plugins and works seamlessly on all major web browsers, tablets and phones. Slate is intended to be a lightweight and simple admin theme to make sure your app runs as fast as possible.